They may only be small, but rodents can have a devastating effect on your personal health and quality of life at home or in the office. Our skilled pest removal team canclear your property of these unwanted visitors and proof it against future invaders. As with many things in life, prevention is always better than the cure. 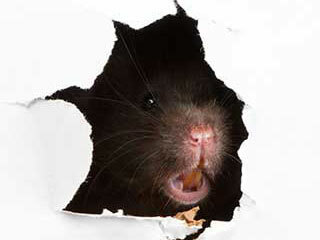 Rodents are capable of entering a building through tiny crevices, cracks, and openings. While a mouse hole is not easily visible, our professional team are trained to identify all points of entry, no matter how small or hidden. Our team will then cover over all entry points with rodent chew-free, steel wool, vital for buildings with a history of rodent infestation. It's better to capture and remove your unwanted rodent guests than to kill them. Strong poison can be a potential hazard to both pets and humans. There is also a danger of spray residue or edible poisons leaking into groundwater and soil, endangering the environment. For this reason, we always practice non-lethal capture. We'll do this with thorough search techniques and sophisticated rodent traps which capture and remove live rodents. It’s a fact, mice and rats as well as being an inconvenience, can also cause significant damage. They can chew through clothing wire, furniture, and paper documents. They can also burrow through wall insulation. Unfortunately, these unwanted visitors can carry infection and illness via their droppings, which they leave behind in food storage areas, living, and sleeping areas. It is important, therefore, to deal with any infestations quickly and effectively. Whether you believe your property is currently infested by rodents, or you simply want to proof it against future invaders, our team at Attic Cleaning Thousand Oaks is here to help you keepyour household and business safe. Don’t let mice and rats take over your property, get in touchtoday and let us know how we can help you.